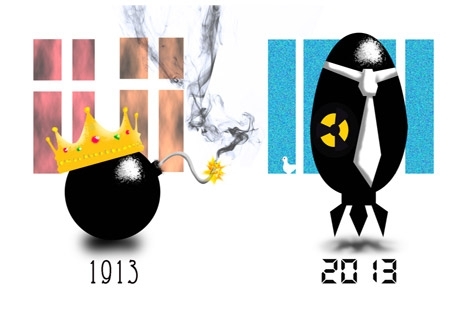 The year 1913 figured as a sort of milestone for the Soviet Union and the world. Today, at the beginning of 2013, we too can sense future changes, but we are powerless to predict the path of history and we do not know where current events are taking us. Drawing by Niyaz Karim. Click to enlarge the image. Not everyone believes in the significance of numbers. Nevertheless, it is interesting to contrast and compare dates as a historical exercise – dates one year, 10 years, 50 years, or even 100 years apart. Interestingly enough, parallels can almost always be drawn. This is especially true when two dates fall at the beginning of a century: a time when the world often finds itself in a state of flux and instability. Anyone old enough to remember the Soviet Union will also remember that, right up until the “developed socialism” period, the year 1913 figured as a sort of milestone – a point of reference to prove how far the country had come under Soviet power. Of course, Russia was not the only place on the brink of massive changes in 1913. The Balkan states were already engaged in active conflict: this was being played out at a local level and without the involvement of big powers, but passions were high and tension had accumulated enough that a small spark was all it took to start a blaze of epic proportions. The situation in the recently established Republic of China, where political murders, coups and uprisings had become regular occurrences, was also far from rosy. In Mexico, the government was replaced several times in one year. In the United States, Woodrow Wilson came to the White House – the president who oversaw America’s debut as a superpower, having taken the decision to become involved in the war in Europe. Once the war was over, Wilson was the one who set out to establish a liberal global peace with proposals that turned out to be unnecessary both to the world and to his own country. On the eve of his inauguration in Washington, the suffragettes put on an impressive parade as part of their struggle for emancipation – the forerunner of many more battles for equal rights that were to take place over the 20th century. Under the command of John Pershing, American troops harshly put down an uprising in the Philippines, resulting in the death of 2,000 people. The Arab Congress took place in Paris in 1913, attended by Arab nationalists who met to discuss the future of their nations as the Ottoman Empire crumbled before their eyes. Mahatma Gandhi, who was to bring about the beginning of the end of the British Empire, was then a lawyer in South Africa. He had just started to become involved in the struggle for civil rights, having taken the helm of an Indian miners’ movement. One hundred years later, many of these events seem fateful: a crucial link in a chain of events with a predictable and logical outcome; but, of course, no one knew what would happen at the time. Even though clouds had been gathering since the end of the 19th century, the old world adopted a regime of business as usual in 1913 and ignored the signs of a looming catastrophe. Today, at the beginning of 2013, we too can sense future changes; but, as always, we are powerless to predict the path of history and we do not know where current events are taking us. In 2013, the Arab Spring is showing little sign of abating; on the contrary, it promises to take on ever more frightening proportions. Whereas 100 years ago the fuse was burning in the Balkan states, today people are keeping a watchful and worried eye on events in the Middle East. A fierce civil war is still raging in Syria, which is directly influenced by events in Jordan, where a change in government is looking ever more likely. Meanwhile, the problem in Palestine is entering a new phase in which the question of a real Palestinian state is essentially closed. The Muslim Brotherhood is consolidating its influence in Egypt. Everything that is happening there is colored by a contradiction between two branches of Islam – the Sunnis and the Shiites. Here, the parallel with the situation in the Balkans a century ago is plain to see: back then, the nationalist and national freedom movement were always underscored and aggravated by religious motifs. However, unlike the Balkans in 1913, the situation in the Middle East today is unlikely to spark a world war. Despite the volatile nature of the Middle East, the main source of geopolitical tension is actually in East Asia and the Pacific Region. China and the United States are the world’s two biggest powers, and they are in a curious state of mutual dependency – a strange combination of political and increasingly military rivalry, coupled with financial and economic interdependency. Relations between these two states are what will define the future stability of the world. Still, even when rivalry is as acute as this, a world war is virtually impossible, given the existence of nuclear weapons. These are arguably the most deadly invention of the last century, albeit one that forces politicians to think much more seriously about the consequences of war. Ironically, this makes the situation more stable than in 1913-1914. Although the threats of 2013 are much more complicated and opaque than they were 100 years ago, the world has at least learned some lessons from the last century. The erosion of law and order and a feeling of danger from a wind of change that is impossible to pin down at the time – this is what the global situation was born out of in 1913, and this is what drives history today. This is just the same as people’s entrenched idea that nothing can be changed. As December drew to a close in 1913, Rainer Maria Rilke wrote to his Austrian friend from Paris: “Here is what I wish for 1914, 1915, 1916, 1917, and ever after: peace and a peaceful life with loved-ones in the countryside.” He wrote this less than eight months before a war broke out that destroyed the old Europe and the world as people knew it. Fyodor Lukyanov is the editor-in-chief of Russia in Global Affairs magazine and chairman of the Presidium Council for Foreign and Defense Policy. First published in Russian in the Russia in Global Affairs magazine.